Looking for tv stands with mounts? What about little kitchen helpers to make for better food presentation? Christmas gifts to beloved kids perhaps? Fabulous outfits? DIY kits for home decorating? Or just a reason to shop for any bargain? Get up to 70% off on these participating brands: Toys "R" Us, Topshop, Topman, Dorothy Perkins, Warehouse, Ben Sherman, Robinsons Appliances, Robinsons Department Store, Handyman, True Value, Saizen, Howards and Mini Stop! 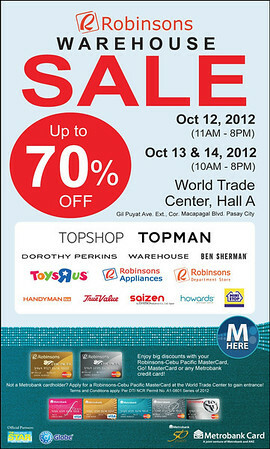 Plus more exciting deals at the Robinsons Metrobank Warehouse Sale 2012! Simply present your Robinsons Cebu Pacific MasterCard, GO! MasterCard or any Metrobank credit card to enter and enjoy the big discounts and deals! Now, I know those days aren't pay days yet for most people but I guess that's where emergency cash and wise use of credit cards can help you purchase necessities (and maybe a few nice-to-have's) at cheaper the cost.